The long-anticipated iOS 11.3 update released to the public a few days ago, and many people have been installing it in hopes that it would address some of the glaring battery problems people have been experiencing due to the throttling over older iPhones. A recent video came out comparing iOS 11.3 vs iOS 11.2.6 battery life and giving us a sense of just how much of a difference we see with the new update when it comes to older phones. When Apple revealed late last year that they were throttling the performance of older iPhones – a practice that many had suspected the company of being guilty of for quite some time – a lot of customers were understandably upset. While the company insisted that the artificial slowing of phones was due to concerns regarding an aging battery and in an effort to improve stability and the life of the phone long-term, many upgraded to a new phone entirely when a battery replacement would have fixed the issue – all due to the fact that Apple was artificially limiting the performance of the device without telling their customers. Since they’ve come forward with this knowledge, they have cut the price of battery replacements drastically and have introduced a new battery management feature on iOS 11.3, but many have been wondering how much of a difference we’d see in iOS 11.3 vs iOS 11.2.6 battery life. This new video comes from the YouTube channel iAppleBytes, a channel that has amassed a decent following doing tests similar to this most recent comparison of iOS 11.3 vs iOS 11.2.6 battery life. 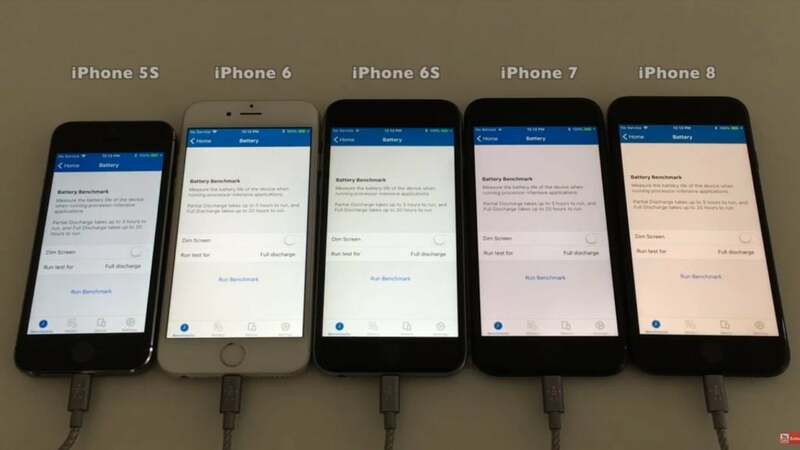 The iPhone 5s, iPhone 6, iPhone 6s, iPhone 7 and iPhone 8 are all put to the test in the interest of learning how exactly battery behavior changes with the introduction of this new feature. Unfortunately, as far as the actual battery life when comparing iOS 11.3 vs iOS 11.2.6 goes, the newer update puts a larger strain on the battery. This may be disappointing to many, but considering that the new battery health feature may serve to drastically extend the usability of your smartphone, the fact that your phone may die slightly faster is likely an acceptable trade-off – especially for those running phones as old as the iPhone 5. The difference in iOS 11.3 vs iOS 11.2.6 battery life isn’t huge either, so we’d still recommend making the jump to the new operating system – especially if your battery is old enough to start taking advantage of the new feature introduced with this most recent update. New in iOS 11.3, as mentioned above, is the Battery Health section in the Settings app that will give you a sense of how your battery is holding up as well as the ability to control whether iOS throttles your smartphone in order to prevent random shutdowns. It’s clear that Apple has valued stability over function previously (if their reasoning for the iPhone throttling turns out to be valid, that is) but for many people, the iPhones slowed down to such a sluggish pace that they were nearly unusable – requiring many people to get an upgrade to a newer device if they wanted to keep utilizing their favorite brand. While the iOS 11.3 vs iOS 11.2.6 battery life comparison swings in the previous update’s favor, it’s clear that the operating system is an improvement over its predecessor overall – and especially for older phones.